Assessment and treatment is an important part of Great Bear’s audiovisual preservation work. Even before a tape is played back we need to ensure it is in optimum condition. Sometimes it is possible to make a diagnosis through visual assessment alone. Spoking is a term used in the AV preservation world to describe the deformation of the tape pack due to improper winding, storage or a badly set up machine. In our experience ‘spoking’ predominantly occurs with domestic open reel tapes. We have rarely seen problems of this nature with recordings made in professional settings. 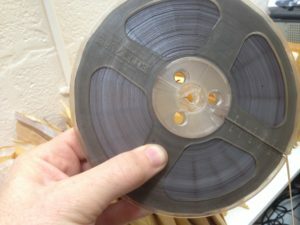 Compared with professional grade tape, domestic open reel tape was often thinner, making it cheaper to produce and buy. ‘Spoking’ in domestic tape recordings can also be explained by the significant differences in how tape was used in professional and domestic environments. Domestic tape use was more likely to have an ‘amateur’ flavour. This does not mean that your average consumer did not know what they were doing. Nor were they careless with the media they bought and made. It cannot be denied, however, that your average domestic tape machine would never match the wind-quality of their professional counterparts. In contrast, the only concern of recording professionals was to make a quality recording using the best tape and equipment. Furthermore, recording practices would be done in a conscientious and standardised manner, according to best industry practice. Combined these factors result in a greater number of domestic tapes with winding errors such as cinching, pack-slip and windowing. The majority of ‘spoking’ cases we have seen are in acetate-backed tape which tends to become inflexible – a bit like an extended tape measure – as it ages. The good news is that it is relatively easy to treat tapes suffering from ‘spoking’ through careful – and slow – re-winding. Slowly winding the tape at a controlled tension, colloquially known as ‘library wind’, helps relieve stress present in the pack. The end result is often a flatter and even wound tape pack, suitable for making a preservation transfer. You are currently browsing the greatbear analogue and digital media blog archives for October, 2016.